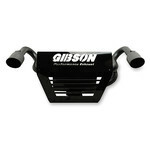 Compliment your Polaris Ranger RZR XP 1000 or RZR XP 4 1000 with a Gibson Twin Rear Exit Exhaust. Get an extra increase of 2-4 rear wheel horsepower, 3-5 more foot pounds of torque and 2-3mph. With Gibson non-packed mufflers you can guarantee a consistent level of sound and performance quality for the duration of your vehicles lifetime. Utilizing a compression spring fitting allows plenty of movement to handle all types of abuse eliminating the possibilities of breakage, Finished with a personalized powder coated rear beauty plate and a complete black Ceramic Exhaust and intercooled tips. All necessary hardware is included for a complete hassle free bolt on installation. Tested with a decibel reading of 96 db's per the SAEJ 1287 testing procedure. USFS Approved Spark Arrestor. T-304 Black Ceramic 4.0" Intercooled Exhaust Tips.